Have you journeyed through Nigeria? 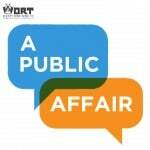 Check out this edition of A Public Affair to learn more about one woman’s journey! On Monday, July 7th, our host John Quinlan interviewed Jefferson-based social worker Faye Kufahl, author of the book “Nigeria, West Africa: Through My Eyes…” about her travels. “Kufahl since an early age developed a fascination with people who’d taken a challenging life experience, and transformed lessons learned into projects that helped other people. This is reflected in the life’s lessons she’s written about in books and essays drawn out of her own family’s experiences with mental illness as she was growing up in northern Wisconsin. About a year and a half ago, those messages, conveyed through her books and over the Internet, struck home with a young African man halfway around the world in Minna, Nigeria, Mamadee “Dux” Dukuly. Dux, who had grown up in an orphanage in his native Liberia and wanted to make a difference for other children from similar backgrounds, had started the Brown Beans Children’s Programme as a means of supporting and empowering local youth. Inspired by Faye’s writings, Dux reached out to Faye via Facebook, and over the course of the next year, he and Faye formed a strong friendship forged out of mutual support and shared insight as they corresponded with each other. When Dux and his wife Masiame extended an invitation to Faye to visit them, the odds seemed against this happening, but Faye, who was not a world traveler, persevered, and found her way to Nigeria earlier this year. It was a brave act of faith for a 61-year-old white social worker traveling alone, one which a number of her friends considered to be too risky given that she’d never actually met the people extending the invitation. However, the generous hospitality of the people she met in Nigeria transformed the trip into a life-changing experience for all involved. All of this played itself out in a country that’s currently in the midst of overwhelming civil strife and sectarian violence, as epitomized by the recent kidnapping of 200 girls by the Nigerian Islamist militant group, Boko Haram. Faye’s hope is that her book will help to shine a light on the generous and highly principled nature of Nigeria’s people, which was in evidence in multiple ways for her. In particular, it’s her hope to strip away destructive myths about Islam and those who practice this faith, and to show the beauty and richness of tradition of the Nigerian people and their varied culture. She also hopes to illuminate the challenges of those living in poverty and facing the consequences of the violence in their lives, especially Nigeria’s children.